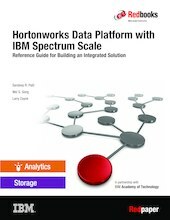 This IBM® Redpaper™ publication provides guidance on building an enterprise-grade data lake by using IBM Spectrum™ Scale and Hortonworks Data Platform for performing in-place Hadoop or Spark-based analytics. It covers the benefits of the integrated solution, and gives guidance about the types of deployment models and considerations during the implementation of these models. Hortonworks Data Platform (HDP) is a leading Hadoop and Spark distribution. HDP addresses the complete needs of data-at-rest, powers real-time customer applications, and delivers robust analytics that accelerate decision making and innovation. IBM Spectrum Scale™ is flexible and scalable software-defined file storage for analytics workloads. Enterprises around the globe have deployed IBM Spectrum Scale to form large data lakes and content repositories to perform high-performance computing (HPC) and analytics workloads. It can scale performance and capacity both without bottlenecks.